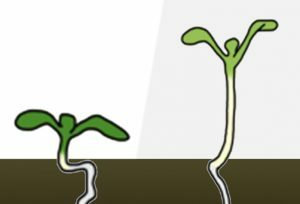 Background: Plant development is strongly influenced by the incoming light. Not enough light may compromise photosynthesis and hence growth, but too much light can saturate the photosynthetic capacity of the plant and lead to oxidative damage. Plants growing in forest understories or next to other plants are often exposed to moments of low light (shading) followed by periods of excess light (sunflecks). In shade-avoiding species, exposure to plant shade leads to adaptive responses such as increased elongation (to overgrow neighboring competitors for light) and reduced levels of photosynthetic pigments (to adjust photosynthesis to the available light). A too strong response to shade, however, might be detrimental if light conditions change. For example, excessively reduced photosynthetic capacity might cause oxidative damage when shaded plants are suddenly exposed to direct sunlight. Question: To cope with oxidative stress, chloroplasts communicate with the nucleus and adjust gene expression by means of so-called retrograde signals. We wondered whether chloroplasts might also regulate the elongation response to shade through retrograde signaling. 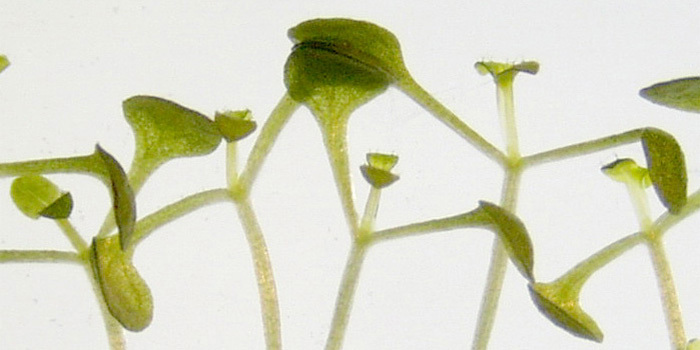 Findings: Using inhibitors of chloroplast function, we found that the elongation response to shade of Arabidopsis thaliana seedlings was attenuated as the levels of photosynthetic pigments (chlorophylls and carotenoids) decreased. Bleached seedlings eventually lose their ability to grow when exposed to shade, in part due to impaired light perception and signaling. We also found that shade-triggered seedling elongation was repressed by the hormone abscisic acid, produced in chloroplasts from the degradation of carotenoids. Together, our results suggest that chloroplast -derived signals prevent an excessive response to shade, hence facilitating the return to non-shade conditions. A mechanistic model of the interaction between chloroplast and shade signals to directly modulate plant development is proposed in the paper. Next steps: Understanding how plants respond to shade will certainly contribute to improve crop productivity, as it should provide important clues to optimally grow plants close together or under other plant canopies. A necessary step in this direction would be to identify the chloroplast-derived signal(s) found to modulate shade perception and light signaling. Miriam Ortiz-Alcaide, Ernesto Llamas, Aurelio Gomez-Cadenas, Akira Nagatani, Jaime F. Martinez-Garcia, and Manuel Rodriguez-Concepcion. (2019). Chloroplasts Modulate Elongation Responses to Canopy Shade by Retrograde Pathways Involving HY5 and Abscisic Acid. Plant Cell. https://doi.org/10.1105/tpc.18.00617. Patrice A. Salomé. (2019). The Shade of Things to Come: Plastid Retrograde Signaling and Shade Avoidance. Plant Cell. https://doi.org/10.1105/tpc.19.00049.